Goodell Shows Usual Patriots Favoritism in Blount/Bell Suspensions | "IT'S A STEELERS WORLD"! 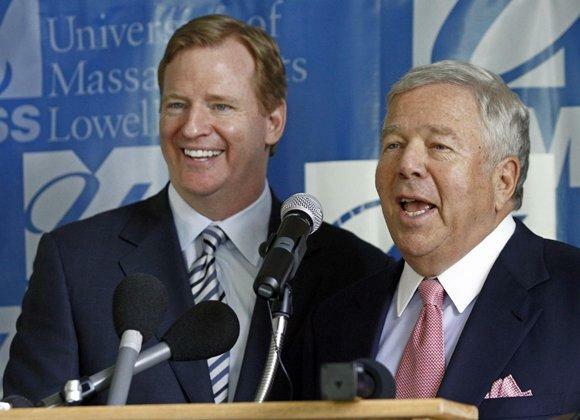 It’s like every time I see NFL Commissioner, Roger Goodell and New England Patriots owner Robert Kraft together they are in some intertwined love affair. How is that LeGarrette Blount, a repeated offender in the marijuana category get a one game suspension? While a first time offender in Bell receives a three game suspension? Sounds like Patriot Favoritism to me. Bell was suspended three games plus an extra paycheck for his arrest of possession of marijuana and DUI (in this case high rather than drunk). His partner in crime that day, then teammate LeGarrette Blount received a one game suspension with no extra dock in pay on Wednesday. Three games plus an extra fine versus one game? That sounds like the work of Steelers hating NFL Commissioner, Roger Goodell. A man who makes no quarrel with handing down “slap on the wrists” type punishments for other team. But swings the mighty hammer of Thor when it comes to passing down sentences against the Six Time Super Bowl Champions. Is that the reason? Does commissioner Goodell come down on the Steelers harder because they are the best team in the National Football League? Or does he just plain hate them? Case in point Steelers linebacker, James Harrison. Who knows all to well about Goodell’s spiteful wrath when it comes to fines and suspensions. Understand, that I am not saying that LeVeon Bell was not suspended correctly. I am saying that a repeat abuser of conduct policy in the NFL should be suspended equally. My only hope is that the Pittsburgh Steelers and The New England Patriots don’t meet early on this season, (within first 3 weeks) because that would be another black mark on the NFL and its shady Commish. Understand your point but Bell had two charges, one DUI and one possession. Blount got possession and opted for community service and charges were dropped. Bell should have got more than Blount. True. But Blount is repeated offender. This is not his first rodeo when it comes to drug possession. Suspend them the same amount. Yeah that damn Goodell is a favoritism showing piece of garbage of a commissioner. He is so bias it’s obvious and pisses me off. The Patriots got away with stealing everybodies plays. Then he had the nerve to come down hard on New Orleans for bounty gate. What a punk this dude Goodell is.